Could you imagine to live you vegan? For me, it probably would not work if only because of my love for cheese. That would be a food to which I could not do without really! 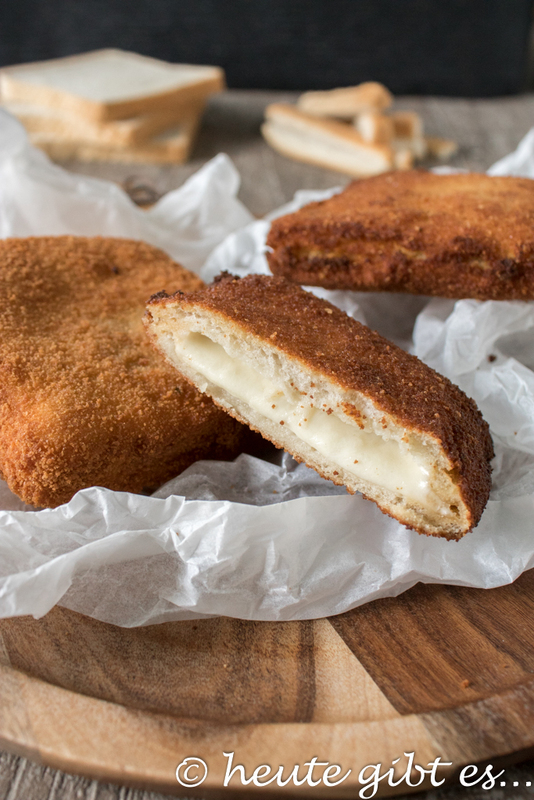 Precisely for this reason, I want to introduce you today one outside Italy rather unknown classics of local street food cuisine, in which the main character mozzarella. 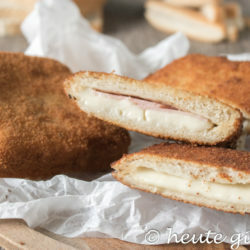 “Mozzarella in a carriage” (in German “Mozzarella in a carriage”) Is the name of this dish, which one called in a “Fry shop” can buy and enjoy along the way. 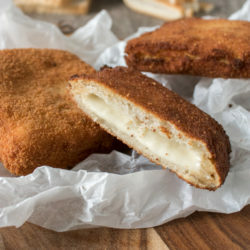 This is a kind of sandwich with mozzarella that is breaded and then fried. Originally the recipe from Naples, where to this day often waives the batter comes. the toast is there instead rolled only in egg and then fried, similar to the known in Germany “poor Knights”. If ye turn asks how the somewhat unusual name has its origins: Before we know square slices of bread came to Italy, was used for this round slices of bread, which enclosed the mozzarella and recalled wheels of a carriage. 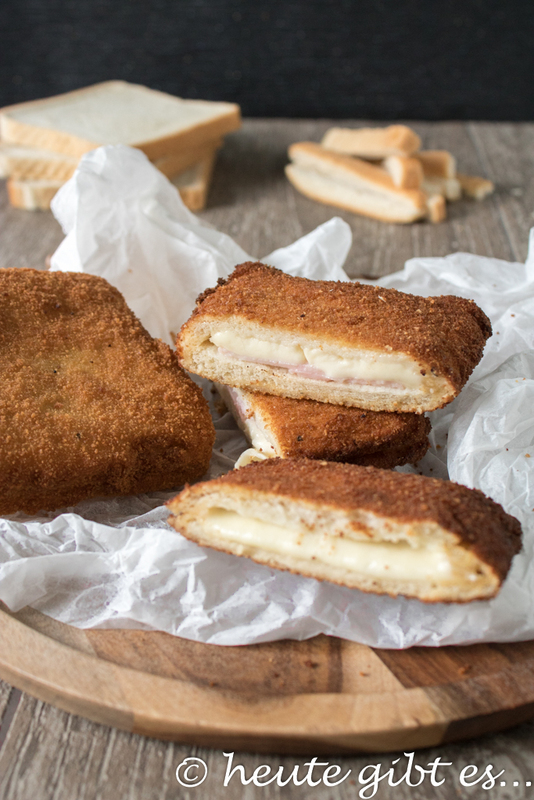 The mozzarella in carrozza used to be a poor man's food, because it was made from stale bread and slightly dried mozzarella residues. 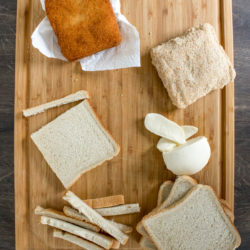 Although thinly cut slices of bread are used in some regions in the budget yet, the usual version, which can be found in takeaways, always of toast. This can also be a few days old like that you will hardly notice the result. 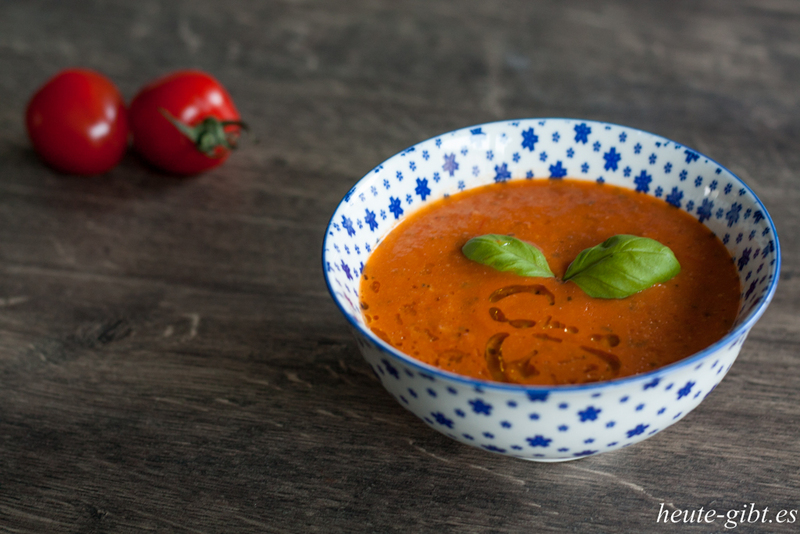 Since you have the ingredients for the preparation usually home available, this dish is perfect for a quick, hot snack or for the recovery of toast. In Sicily, the whole is still spiced up with a little ham. Should you so something cold cuts, fresh basil or similar to spare, you can also pick this Court as the Piadina romp with the filling. It is then not longer the classic version, but certainly just as delicious! The slices of bread debark. Cut the mozzarella into slices about 0.5 cm thick and about 2 pieces spread on a slice of bread cheese so that a thin edge remains. Close the sandwich with another toast slice. The eggs in a shallow dish, whisk together well and season with salt and pepper. also keep ready the flour and breadcrumbs in shallow bowls. First floured the sandwich round, then dip each side of the egg, making sure that the edges are pressed together so that they remain closed. Finally, good roll in bread crumbs, so that a uniform batter is formed. Here again well compress the edges. temporarily store on a plate and deal with the other sandwiches as well. 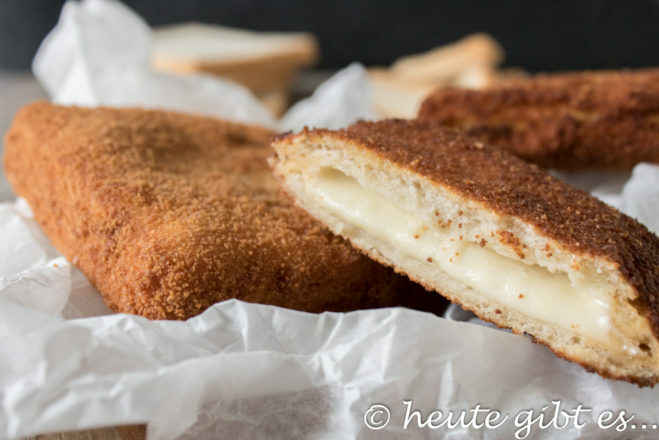 In a hochrandigen pan heat the oil and fry until golden brown in carrozza in hot fat mozzarella. put the end on some kitchen paper to remove excess fat capture and enjoy warm. be sure to drain well before using the mozzarella. 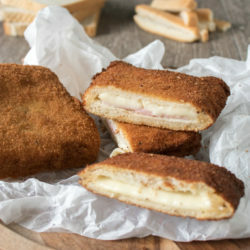 Depending on the region of this finger food is refined by some béchamel and ham. Of course, you can vary the filling to your liking. but ensures that the ingredients do not contain too much liquid! 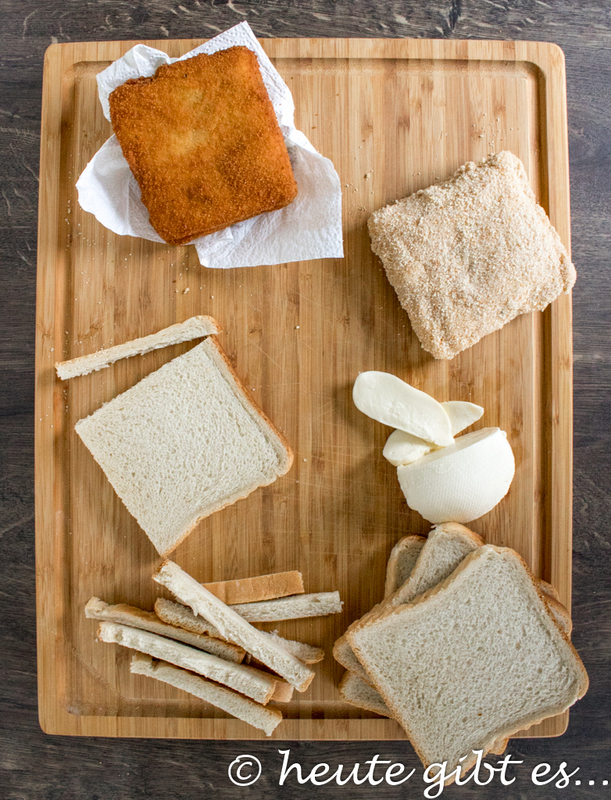 If you are not friends of fried food, you can give on a lined baking tray and bake at 200 ° C (conventional oven) for 15 minutes, the finished breaded slices of bread. 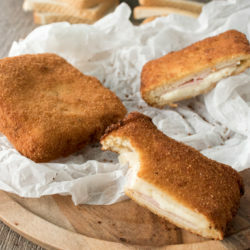 An even healthier alternative would be the version of Naples, that completely omit the batter and fry the bread dipped in egg in a little oil. 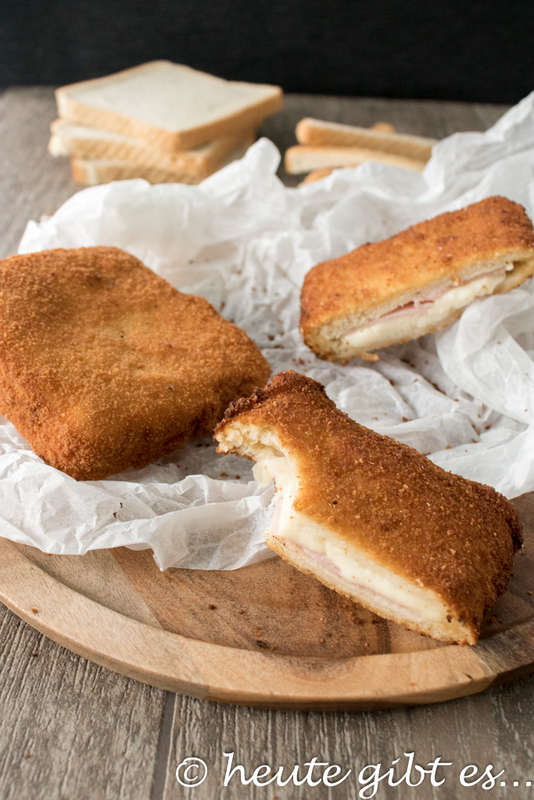 You can mozzarella and also prepare beforehand to the breading evening in carrozza, keep refrigerated and deep-fry the next day. 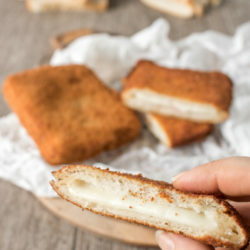 Here, however, it is very important that the mozzarella was really good drained, otherwise the slices of bread to soak too much and does not match the consistency of the result. Freezing is not recommended for this dish. What do you think of this a different kind of sandwich? 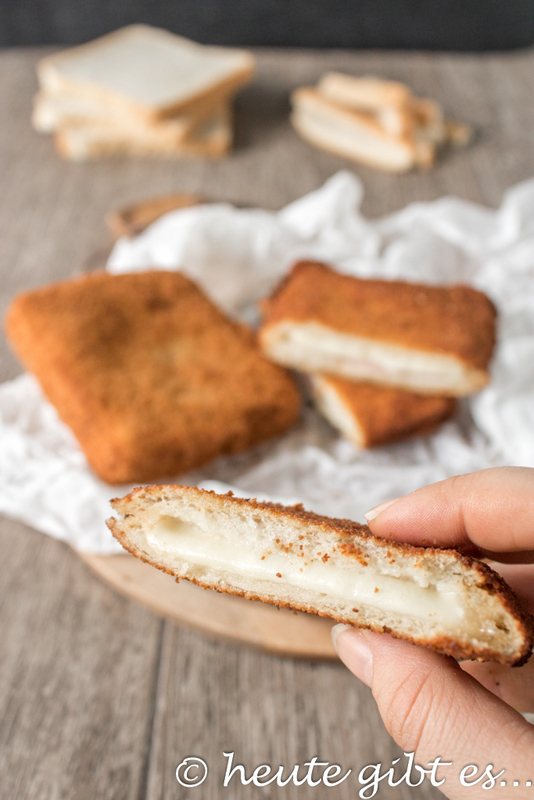 Even as a child I loved to eat street food of this, because what could be better than warm, melted mozzarella? 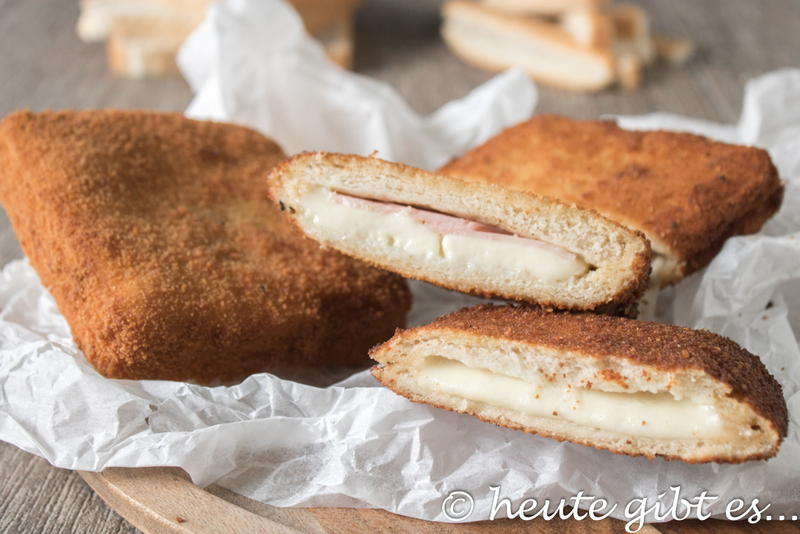 4 Kommentare zu "Mozzarella in carrozza – Sandwich with a difference"
A healthier option would be certainly the use of whole wheat toast and instead of frying, bake the sandwiches in the oven (see my tips in the recipe box). What I think about that? I can hold them only with difficulty, to jump immediately to run into the kitchen and make me a couple of them !!! na in this case I do not want to stop you 😉 Let it taste you!